Richard Walker's Blog: How long until Jesus returns? Matthew 24:14 states that the good news about Jesus must be told to all "ethne" (that is all people groups/tribes etc) before Jesus will return. The pie chart (see right) is from the Operation World website. You can download the whole presentation it comes from by clicking here. If it is to be believed, then the strategic big picture of our efforts appears to be misdirected since most of our missionaries are going to places where there is already a viable Christian witness. Now please don't mishear me! I say a hearty God bless you to people who leave their homes and travel anywhere to live for him. But if you are like me then pie charts like this one cannot but make you stop and think. 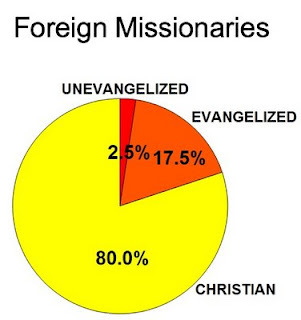 Of course there are legitimate reasons why the numbers of missionaries to these countries is so few, not least because many of them are so closed to outsiders and it is therefore notoriously difficult to get into them on anything but a tourist visa. But the fact remains that they need Jesus and we have him to give. And if we are serious about wanting to see him return in our lifetime, then it's time to pray that God would increase the size of the red slice in this pie chart and ask him what we can do to make that red slice grow in either going ourselves or resourcing others to go!